A small faith- sharing group meets to pray and experience the Divine Mercy Message and Devotion through the study of sacred scripture, the “Catechism of the Catholic Church” and the “Diary of Saint Faustina”. Members are encouraged to practice the spiritual and corporal works of mercy, especially in our parish community. 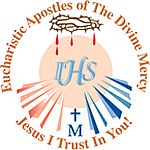 The EADM group meets Thursdays from 2:00pm—3:00pm in the Bryerton Room with praying of the Chaplet of Divine Mercy at 3:00pm in the church. A group that meets to pray and learn about Divine Mercy through the writings of St. Faustina, whom Jesus entrusted to bring the message of his mercy to the world. The group seeks to promote devotion to the Divine Mercy in three degrees: in actions by doing the spiritual and corporal works of mercy; in words by sharing the devotions of the Divine Mercy, for example, Divine Mercy Sunday; in prayer by praying the Chaplet of Divine Mercy for the needs of the world. Jesus told St. Faustina, “In these three degrees is contained the fullness of mercy.” (742 in St. Faustina’s diary). The Cenacle meets on Thursdays from 2PM-3PM. followed by praying the Chaplet of Divine Mercy in the church. You may participate as a “regular” member, or come on a one time basis to learn how you can embrace Divine Mercy into your own life.